Female Soldiers Are Already In Combat Without Getting Credit For It. It Was Long Past Time For a Change Of Rules. My parents were both U.S. Marine vets. I had an uncle who was an Air Force vet, five great-uncles who were Army vets, and one great-uncle who was a Navy vet. When I joined the U.S. Navy, nobody was too surprised. In 1976, when I reported to my first duty station, Panama City, Florida, the United States had been out of Vietnam for over a year. Panama City was a small base consisting of only a few hundred active-duty sailors. Many of them were seasoned warriors. My fellow Navy service members made up a diverse community of people from across the United States, from all walks of life. The emphasis was on discipline, teamwork, ethics, and excellence. I loved it. My assignment was in healthcare, which made the Navy perfect for me. I was supporting my fellow men and women in uniform in their hours of greatest need, when they were sick or hurt. I wound up staying in the service for two decades. During those years, I worked emergency rooms, flew as a Search and Rescue Corpsman, and recruited and trained Naval healthcare professionals. As a young female corpsman, I was generally treated well, but of course I recognized that I was working in a man’s world. At that time, women made up only 4 percent of all active-duty military. Junior enlisted men called us “honey” and “sweetie,” and a woman had to learn fast how to control the situation around her. That included avoiding certain officers known for inappropriate comments or, worse, inappropriate touching. 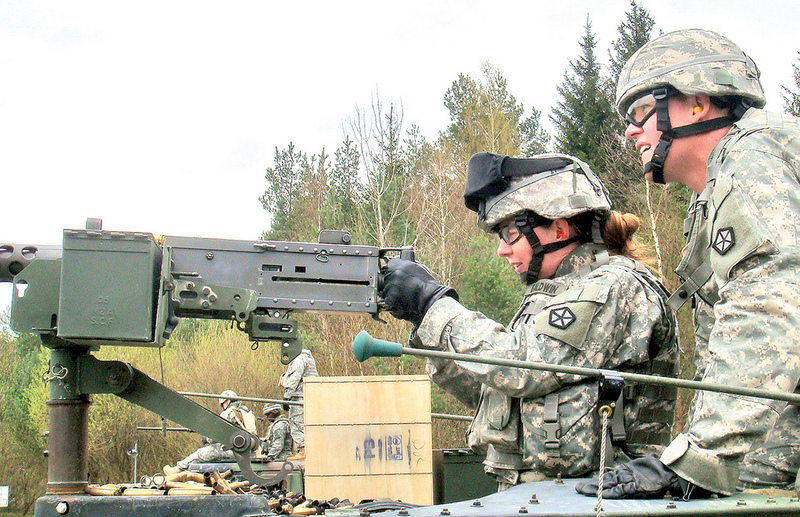 Today, we women have grown from 4 to 14 percent of the active-duty population. Service members now get special training to deal with sexual harassment. And more women than ever before are serving in senior enlisted and officer positions. One key breakthrough came in 1994, when the Pentagon announced new rules that opened up many jobs previously unavailable to women in the military. Female service members would now be eligible to serve in 99 percent of all positions in the Air Force, 90 percent of positions in the Navy, and 67 percent of positions in the Army. One ban that remained in effect was on women being placed in roles involving direct ground combat. But even within this ban there was a loosening: women were permitted to be in ground combat support positions, provided that there was a low probability of encountering close enemy fire. At the time, many of us had a feeling of excitement. Glass ceilings were being broken. But by the time the wars in Iraq and Afghanistan were underway, it had become clear that opening up women to a greater number of support positions was also opening up women to combat, and the results were—and are—unfair. What I mean is this: women have regularly been placed into full-scale combat with neither training nor official acknowledgment of their roles. For example, in the war in Iraq, women have been attached to Marine battalions and thrown into intense fighting in places like Ramadi. These young women, despite having no infantry training, have fought in some of the bloodiest counterinsurgency battles of the Iraq war and returned home as part of this country’s first generation of female combat veterans. To date, over 200,000 women have served in wartime Iraq or Afghanistan. One hundred thirty-four have been killed, and another 721 have been wounded in action. They have stood shoulder to shoulder with their male counterparts on the field of combat, yet they don’t receive proper training to do so, and they have not received formal recognition of their battlefield experience. Back in the U.S., they will be less likely than their male counterparts to get promotions, and they will not receive the veteran benefits given to males who have seen combat. That’s why the news on Wednesday that the Pentagon has lifted its ban on female soldiers in combat roles made me very happy. I noticed many people posting online that this is a dubious achievement for women—that placing yourself at greater risk of being shot or blown up is hardly a step forward for women’s rights. But these commenters are missing the point. Women already are in combat. (Even as early as the Revolutionary War, women—like Margaret Corbin, who handled ammunition for a cannon during the attack on Fort Washington in 1776—were serving.) With the amorphous front lines of Afghanistan and Iraq, women are constantly forced to take up arms in the midst of enemy fire. With the Pentagon’s new rules in place, female soldiers will receive proper training for their dangerous jobs, and they will be considered for the military’s very highest posts—such as commandant of the Marine Corps, or CENTCOM commander, or chairman of the Joint Chiefs of Staff—jobs that only combat veterans are likely to get. Will there be challenges with the new rules? Yes, but fewer than people think. In a 1997 study on “Effects on Gender Integration on Cohesion,” the RAND Corporation found that “women’s presence had raised the professional standards of conduct in the military workplace.” A separate study found that women are capable of meeting surprisingly heavy physical requirements, including the toting of combat gear. There should be no doubt that women, who have already fought alongside their brothers in uniform in the midst of bloody battle, will continue to serve just as bravely as before. But now they’ll also get some long overdue recognition for it. Stephanie Stone, USN Ret., is Chief Deputy Director of the Department of Military and Veteran Affairs in Los Angeles County. Primary Editor: T.A. Frank. Secondary Editor: Sarah Rothbard. *Photo courtesy of Joint Base Lewis McChord.